The Hawick Combination comprised the 13 parishes of: Ashkirk, Canonbie, Cavers, Ewes, Hawick, Hobkirk, Kirkhope, Kirkton, Lanholm, Lilliesleaf, Minto, Roberton, and Wilton. The total population of the member parishes in 1881 was 30,777. The Hawick Combination poorhouse was erected in 1857 at a site to the south of the town, just off Drumlanrig Square. It cost £4,000 and could accommodate 133 inmates. The poorhouse location and layout are shown on the 1901 map below which, unusually for Scotland, describes the premises as a "workhouse". 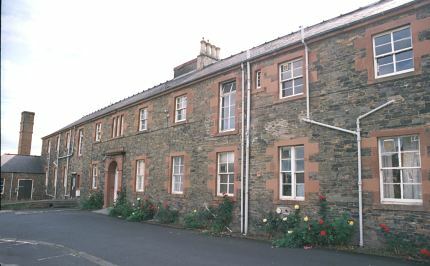 Hawick main block from the west, 2001. The two-storey building included dormitories for males, and 3 for females. Hawick main block from the east, 2001. During the First World War, the poorhouse building was entirely placed at the disposal of the military authorities. After 1930, the poorhouse became the Drumlanrig Poor Law Institution serving the whole of the county of Roxburgh. The site later became Drumlanrig Hospital but in 2001 the buildings were unoccupied. In addition to its participation in the Combination, the parish of Canonbie had its own small poorhouse or almshouse. Thes establishments was administered by the Parochial Board rather than operating as a statutory poorhouse under the central Board of Supervision. The 1881 census indicates that the poorhouse was located at the north of Canonbie, in the vicinity of Knottyholm Farm.